I bought 100 Multibox Runs, helped me alot to get started into the Season and i can Easly Speed Clear T13 now. Its a Great and Fast Service, really kind guy and he really does evrything he can so you have a enjoyable time. Would defently Order again at this guy . He as well helped me alot with Builds he also took the time to boost when ever i got time. So its no problem if you dont got much time just do it like i did it over couple days. These guys are awesome. They were incredibly fast, nice and kept me updated the whole time. Took my toon from level 1 to paragon 627 with gear capable of clearing 80 Grift. Gems in gear are at level 72 with some gems at level 60 for augments. I could pick these guys up in a hug and kiss them on their faces man. This took me MONTHS to do on my toon on Xbox 1 and I really didnt want to start from scratch. These guys made it happen in 3 friggen days. I recommend them 1000% and I will be using them again down the road. I picked them because from the reviews they had set the bar high on what to expect. They just smashed those expectations and exceeded them by so much. Spoke to Kenny last night about 1000 Legendary drops + 20 Hellfire portals, We made a very nice schedule that worked really well for the both of us and started the farm pretty much the same hour and now less than 1 day later we are done. It was very smooth and extremely quick. 10/10 Best guy out there! Bought 500x Legs for Monk done through multibox. I'm very happy with my order and I've been with Kenny for a few seasons now and it's always quality service. Great prices and a great person all the way. If you want top notch service I suggest you contact Kenny - you won't regret it! Third time I work with Kenny, order a 500x legendary with my monk this time! It went smooth and fast like always, Kenny is really supportive and thinks with you build and stat wise. Because I had a lot of work in real life we split up the session in 4 little ones. Which was really nice for me! I ordered 500x Legendaries. I got a super quick response on Skype and he was very polite and kind. He also recommended me a class without forcing me to take the class. I wanted to gear my Monk up as fast as possible to start serious Grifting. After we were done i pretty much had all the legendaries I needed for my desired build and even more. I could directly start into competitve grifting. The order was also done quickly. Sure you might have to wait a couple hours before the boosting starts, but well... it's Season start. Another big plus point is, that this guy already has 3 classes ready for Multiboxing!!!! What a beast! Season started 3 days ago. If you looking for awesome professional multiboxing service and good prices, search no more. You got it! I bought 500x leg pack for monk in multibox, seller(kenny) has the knowledge and skills to perform the job. We discussed everything including the time that works for both of us, very adaptive. Service is overall above average and in my opinion probably one of the bests. Seller(kenny) also keeps you notified what is going on with the order which gives the buyer a nice overview of what is actually going on. Professional and definitely comming back! You wont be dissapointed. I just bought the 500 Legendary Pack from this superb guy. We could start right away and it was super fast(probably done in about 3,5 hours). I am perfectly geared for T13. So what else could I say. I am super happy with his service and he is a super kind and friendly person. Definitely come back to buy more. Very recommendable. Bought 500x Legs from Kenny and the experience was top notch. We finished the very same day. A very pleasant person to deal with. Professional, polite and a lot of fun to deal with. I'm very happy with my purchase, so I will absolutely return for more. Awesome guy and most likely the best booster here on EpicNPC. Buy from him - you won't regret it! Did a 500x Legendary run with him today! All went super smooth and fast. We were done within the same day. Only took us a couple of hours. Really friendly professional service. Isn't money greedy but actually helps you to get the best suitable package. At first i ordered a whole other package which would've cost me 20eu more. While Kenny said, the cheaper one will suit you better (500x legendary). Skilled, friendly, verry good communication. Would recommend this guy to anyone who is looking for a bit of help in D3! 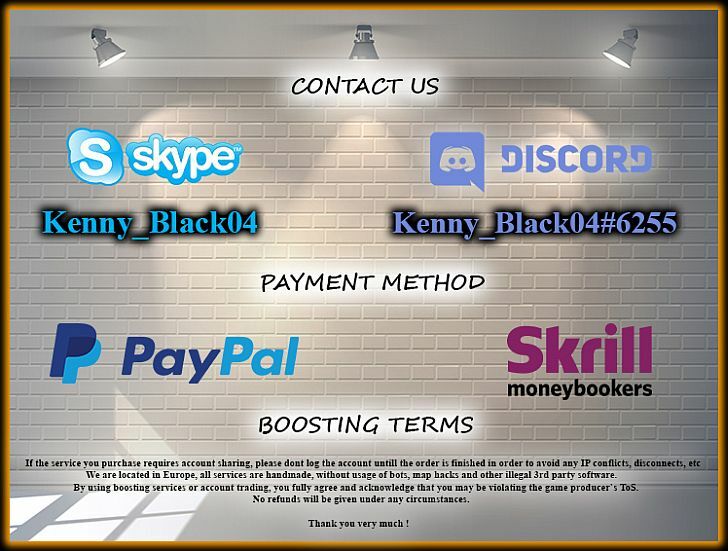 Added Mr Kenny to Skype and he responded within a few min, i wanted to boost my WD, but after some talk we came to the conclusion that Wiz would be best for what i wanted, said and done he made a new char for me and off he went. Kenny sent pictures of progress during the leveling and grinding and was VERY PROFFESIONAL, I will definatly ask for his help in the future ad i truly recommend him, friendly, positive and honest and lisening to your request. This is the first time i bought a service like this and WOW he gave me a HUGE smile!! Ordered GR60 & Starter Pack. Upgraded the Starter Pack to another GR60 out of the Kindness of his heart and because he had the spare time to do so. Very good communication, Willing to explain and make sure I understood how to upgrade after he finished and was willing to go the extra mile in general. He was very honest when it came to custom services, being very blunt and letting me know if it was a waste of money or if it would cost a lot and was better to just do it myself instead of paying to have it done. Overall someone I'd gladly re-order from. I was so happy for the first Boost for GR60 that Mr Kenny did for me so i had to order a second char to GR60 said and done Mr Kenny Went to work with my DH, and OMG the service ppl!!! He suprised me yet again with his fast progress! 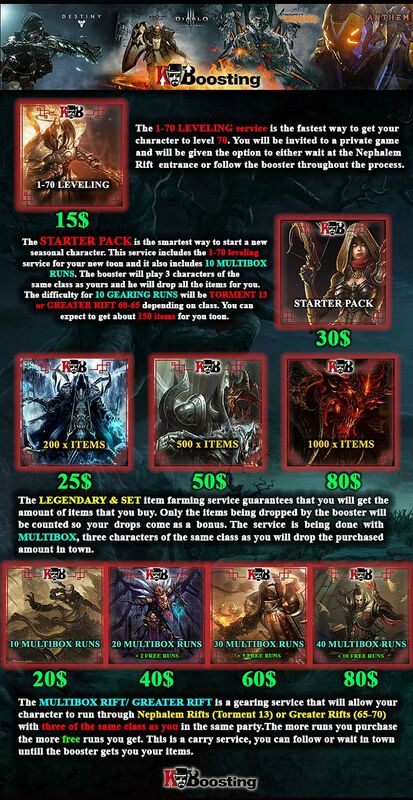 Basically this guy sells the best package in the site, and I am highly recommend this to new Diablo 3 players. This guy is incredibly fast, very nice guy, talking a lot, giving advices, would recommend 100% ! Ordered 100 legendaries and 10 Hellfire Amulet runs. He was extremely fast, pleasant and wound up giving me more than I asked for. very nice contact, fast delivery and very helpful, can fully recommend him! Just bought boost for Monk and Witch Doctor. Got over 200 legendaries on each! 400 Legendaries in 20 Grifts and only took like 1 1/2 hour! ******* amazing service! Not to mention the hundreds of paragon levels, will DEFINETLY recommend and use Kenny again! There is none better for ur diablo 3 needs! Both chars got full sets of every class set too ! so happy! Great service, great price and he helped med getting both gold and legs for my freshly dinged barb. Recommended! Super fast and helpful as always! +1 for kenny! Bought 500x Legendaries yesterday for my new Season 8 Demon Hunter. Kenny is a top notch guy! Professional, easy going and very fun to run with. I'm 100% happy and satisfied with the service he provided and my Demon Hunter is now very, very good. Will absolutely return for more boosting. Look no further - go with Kenny! You won't be disappointed. season journey went to fast thanks to this guy, always fun to do business with Kenny. The final result was great and it was delivered very fast! He is very skilled, friendly, and we had a very good communication during all the process. I recommend his service to anyone who is looking for a bit of help! 10/10 really nice guy got 1-70 for free and 270 legs/set. Second time using Kenny, just as good as I remembered - great service and a really friendly person to deal with. Bought 10 grift runs for Monk. This guy is amazing! Really friendly. Amazing service, super fast. Well worth the money. Fast delivery and very nice guy, thanks mate! I placed order on the 6th august, 1 day after season 7 lunched. By the end of day 2 this guy had his WD ready! We did 40 runs easy and after 4 days im sitting here doing 80s with my clan! Really recommend loyal guy and extremely fast character gearing! Really fast and kind trader, would recommend to everyone! First of all, let me just say that this guy is awesome; and was fun to be around. Decided to get the 100x Legendaries / Set items from kenny_black04 and give it a go. He's a very nice person to chat with and seemed to have a great amount of humor as well. I will definitely come back for more at some point - But for now I can only recommend him, great guy. Go get him! Great service & I would highly recommended 10/10. First i asked him a lot of things related to DH and Barbarian so i finally choosed DH. Then I bought 10grift runs, they were very fast, excellent service and even sometimes he gave me advice about gearing, when doing grifts. At the end, he just helped me to sort all things out what we looted, what passives to use, how cube works, how u can get gems with cube(flawless etc) easily and how to gear up what to keep . I'm just really impressed, how smooth it all went. So reliable person and trustful af. Today i just order 200x legged run fast guy greater work 100% reliable recommended. + rep, very friendly and easy boost! Bought a boost to GR 60 season 6. Not only is he really trustfull, he is fast, friendly. Sended me screenshots or updates everytime i asked for one. He even helped me figuring out what build would suit my playstyle the best etc. You can 110% trust this guy! Within 12h it was all set and done. 11/10 if i could give that! Will definitely stop by here some day again! Thanks for your great service sir! 10/10 Been buying boosts for 3 seasons now. Fully geared WD, Barb, Wiz and monk in just 2 weeks of self play. Very fast and nice guy to get to know. This guy is very friendly and makes a great effort to let you know how he is progressing on your character. GR50+ Wizard ordered and he posted screens to keep me updated, as well as letting me know where to look on how to play the build he's working on. Amazing service, will definitely be back for more! Purchased 20x 45 Grifts for my wizard with 3x Loot, 300+ Legendaries, full Firebirds, Chantodos etc! AMAZING service, and a very cool and down to earth guy, 10/10 would DEFINETLY use Kennys service again! Can recommend to ANYONE! Thank you so much man! Great service as usual. Highly recommend! Very fast answer and reliable boost. I am happy with this service! i have used it both Season 4, 5 and now Season 6. Two GR60+ in only three days!!! In season 5, of course!! +1 for season 5 boost! We ended up doing tier 50! Always great communication and good flexibility of time. Currently running crusader multibox and its going great! Ordered a boost for 1-70 season 3. It was done in 45mn. This guy is awesome and legit.. Very much recommend him to anyone. Thank you buddy ! Anytime ! As a quick update, first of all i wanna welcome you all to my services ! As some of you already noticed, the "madness" has already started so i`ll try to take and manage your orders the second you contact me but there are cases when we have to schedule because now, at early launch of the season, you can imagine there are alot of requests and i`m all alone so i apologize when this situations occurs. A short notice for my old customers : You probably noticed that starting this season i made a single service for TORMENT VI RIFTS and CLASS RUNS and bonuses are kept from CLASS RUNS SERVICE ( 10, 10+3, 10+5, 10+8, reset ). Loyalty is a big word for me so as a reward you will be charged the same price as last season ! So 1,5 Euros / rift or class run ! Today i`m starting TORMENT VI RIFTS and DEMON HUNTER CLASS RUNS ! Wednesday a new service, CLASS RUNS : WIZZARD will be available ! My plan is to start the next service CLASS RUNS : MONK on friday aswell ! I`ll keep you updated so make sure you constantly check the thread for updates ! Just did 10 runs on t6 (season 3) with kenny black he was very nice overall on skype and good player, recommend him to all who would like a extra boost. Extremely polite,professional and everything as always went smooth!I bought 10 T6 class runs today,got all the legendaries unidentified and even the set items i wanted! Just enjoyed a wizard class run: 10x T6 rifts and got the loot of 4 wizzards - awesome! Friendly, spontaneously and fast.. Thanks again! Will buy again! Thank you very much for your feedback mike44, sleeplesj, Qqz. Pleasure was all mine ! Enjoy your loot ! Thanks for feedback Emce ! It was my pleasure buddy ! CLASS RUNS : WIZARD service is now available ! Aswell, i have introduced A NEW SERVICE : GREATER RIFTS LEVEL 25 .So for those of you who want to get/level up their gems while getting bloodshards, xp and loot, this new service is now available. As mentioned in the thread price per run is the same as regular T6 run, 2 Euros / Grift25. See you all in game ! Happy hunting ! It's easy! This is the guy you go to for all your season 3 EU softcore needs. He's fast reliable and you get ALL the loot. I've been customers since season 2 and no other seller beats this dude. 11/10 if it was possible. Thank you Nazeebo ! All my respect ! Always my pleasure ! Thanks for the nice feedback lanplz and for using again my services ! Really apreciate those kind words ! CLASS RUNS : MONK service is now available ! As alot of customers requested it, my next project i`m taking care of is CLASS RUNS : BARBARIAN service estimated to be available on 22.04.2015 ! Make sure u constantly check the original thread for updates ! CLASS RUNS : BARBARIAN service is now available ! very nice and freindly player! also nice speed runs would recommand to all. and indeed gives all legendaries! Just finished 10x Grifts level 25 as a barb, was really quick could not complain about a thing, kenny even went out of his way to help me get my last key buy doing a quick t6 rift for free. will be looking to get more boosts later! thanks again! Thank you for the kind words Dooitz and Solus89. Indeed nice runs and loot, GG ! and good lord have i been rewarded with many legends and 105 para levels + 70 normal levels! A+++++++++ trustworthy, efficient, loyal & friendly, you can't ask for more then this! You ask, he delivers and all items are unidentified. and alot of double items just to be sure for more decent rolls on stats! that being said i am prepared for t6 soon since am a bit late into the season thank you and gl with future boosts! Thanks for the kind words, Spreewee. Its been my pleasure, anytime ! Nice dude and Awesome service! Thanks for the feedback MegaFizzle ! My pleasure mate ! CLASS RUNS : WITCH DOCTOR and CLASS RUNS : CRUSADER services are now available ! I finally finished my complete order and again it was handled proffesionally ! first bulkathos weapon ancient, and on last run, my second bulkathos ancient dropped! a necklace with 10% chc & 100%chd!